There's nothing quite like the sound and smell of fresh, sizzling fajitas — and this recipe makes the finished plate even more exciting with a zesty lime cilantro marinade. First, whisk together the aforementioned flavors and let chicken breasts soak in the sauce. Then, grill the meat and an assortment of veggies to a slight crisp: it's a mouthwatering and healthy meal that can be whipped up in under an hour. Devour the fajitas alone, or roll the chicken and veggies up in a tortilla with a generous dollop of homemade guacamole. Either way, a squeeze of fresh lime juice and a few sprigs of cilantro put the finishing touches on the feast. In a small bowl, whisk together the lime juice, olive oil, brown sugar, garlic, cilantro, salt, cumin, paprika and coriander. Place the chicken breasts and marinade in a Ziplock bag, making sure to coat all of the chicken. Refrigerate for 30 minutes to let the flavors marinate. Then, remove the chicken from the bag and cut into strips. Reserve the marinade in a small bowl. Heat your grill or indoor skillet over medium-high heat. Add chicken strips and cook until done, or for about 4 to 5 minutes. Baste with the leftover marinade while cooking. Using the same grill or indoor skillet, cook the peppers, jalapeño and red onion until slightly softened and charred. Mix the peppers, jalapeño and onion together with the grilled chicken. 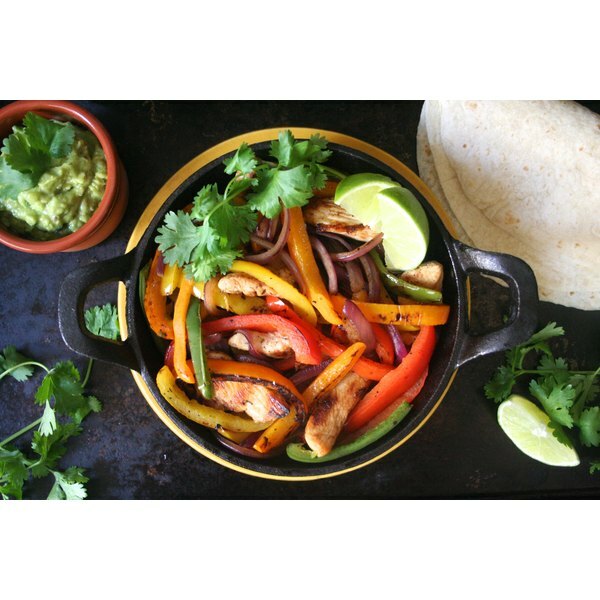 Serve fajitas in a pan, or inside a flour or corn tortilla. Garnish with cilantro, lime wedges and homemade guacamole. Caroline Stegner is the creator, editor and photographer of Sweet Caroline’s Cooking. She is a self-taught cook and baker who expands her culinary knowledge and experience via trial and error. Aside from cooking, Stegner enjoys tap dancing and anything and everything music-related. Should I Let Pastry Shells Thaw Before Cooking?